1. Check the components: Your clock should have two weights, one pendulum, one dial and movement, one trunk, one hood, a crank winding key and keys to lock the doors. All of our longcase clocks are securely packed with setup and maintenance instructions included. 2. Select a location: You will need to decide where to locate your clock. It's very important to place a longcase clock on a flat surface, tile or wooden floors are best. Carpeted floors don't offer the stability required for proper functioning. If the floor is carpeted, however, place a piece of hardboard, cut slightly bigger than the base of the clock on the carpet, then stand the clock on the hardboard. Shim the feet as necessary to make the case vertical and solid. Your clock can be placed anywhere in your home but you will need to be careful when placing it near a radiator or other heat source due to the possibility of damage to the case. 3. Place the dial and movement onto the clock﻿﻿:﻿ Once the dial and movement are in place, carefully place the hood or bonnet on to make sure the dial is positioned centrally with the dial case door closed. 4. Hang the weights: You will see two cords inside the case hanging from the movement. They will be red if original. A hook is attached at the end of each cord. Simply hang the weights, one at a time onto the hooks. The weights will be marked left and right if needed. 5. Hang the pendulum: Most pendulums have a front and back. The flat, polished part of the pendulum bob, should be at the front. A pendulum hook is attached onto the back of the movement. Slide the pendulum inside the pendulum door in the clock trunk and up through the pendulum hook so that the tip of the pendulum falls into place. 6. Set the pendulum: Now, simply rock the pendulum. You should hear a steady and even, tick-tock, tick-tock. If you hear this even sound, the clock is in beat and should keep going. If the beat is an irregular tick-tock-----tick-tock, an adjustment must be made or the clock will stop. This can be done by placing a shim under one of the front feet to lean the case in the direction which brings about the steady tick-tock, tick-tock beat. Lock the pendulum door once the pendulum is set. To keep time accurately, pendulum clocks must be absolutely level. If they are not, the pendulum swings more to one side than the other, upsetting the symmetrical operation of the escapement. 7. Set the time and date: When setting the time, only the minute hand (large hand) can be moved, then only in a forward motion. Open the dial case door and gently move the minute hand clockwise only with your finger until the clock indicates the correct time. When turning the hand, move it slowly as you near each hour. Listen for a click and pause for a few seconds to allow the clock to prepare itself to strike the hour, and then gradually move the hand up to the hour. ALWAYS allow the clock to strike each hour fully for the particular hour that you are passing before moving the hand further. This will stop any damage to the striking mechanism. NEVER turn the minute hand backwards, and most importantly, NEVER turn the hour hand at all, in any direction. Some clocks have a date indicator. If your clock has a day count hand, you can set the date by gently moving the hand clockwise to the correct date. Close the dial case door. 8. Regulation: When you first get your clock it may take a couple of weeks for it to settle into its new environment and will most likely need “regulating." It will only keep accurate time if the pendulum is set at the correct length. The nut located on the bottom of the bob is used to adjust the time keeping ability. If the bob is raised, the clock will run faster, if lowered, the clock will run slower. Just remember the phrase "A short dog's tail wags faster." If your clock appears to be running slow, open the pendulum door and stop the pendulum. Next, turn the adjustment nut below the bob clockwise and the bob will be lowered, slowing the clock. The amount turned will give a different degree of regulation change — if your clock is running a minute or so slow over a few days then ½ to 1 turn should be enough. After adjusting the bob, move the minute hand forward to the correct time and start the clock again by swinging the pendulum. If your clock is running fast, stop the pendulum and turn the adjustment nut anticlockwise, which will push the bob up, speeding up the clock. Wait until the clock reads the correct time and then restart it by swinging the pendulum. Close and lock the pendulum door. 9. Enjoy:﻿ Appreciate your clock. It's easy to forget it isn't new. Antique French longcase clocks are hundreds of years old. Treat yours with care and make sure to wind it regularly and have it serviced every 10 to 20 years. Whether it's a rustic pine clock or a grand Louis XV clock, a French longcase clock will add life to any home. 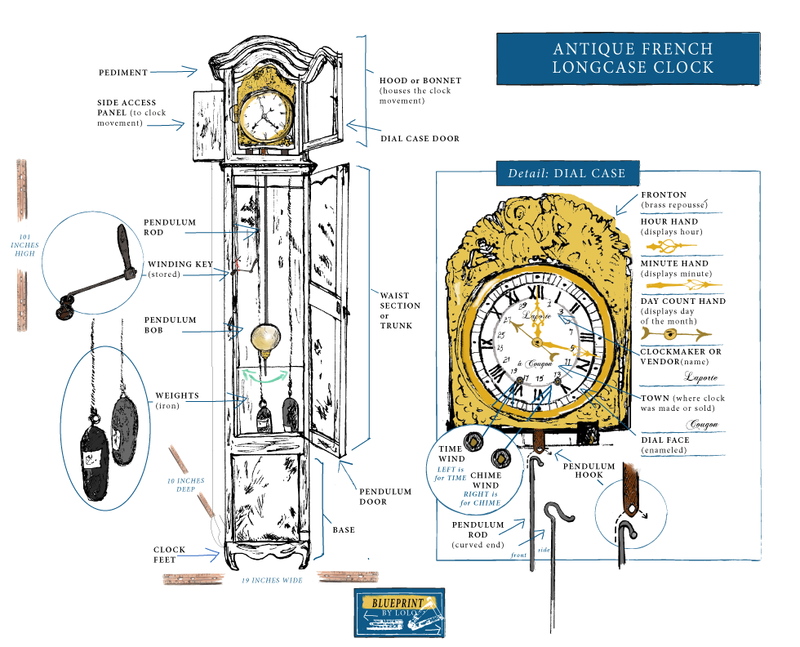 There's nothing like the tick-tock of a stately antique French longcase clock. Winding — Your clock will require winding only once a week. It's known as an eight-day clock but it should be wound every seven days. It's driven by two weights — one driving the pendulum or time (left) and the other the striking mechanism or chime (right). These movements have a keyhole or winding hole on either side of the dial face. To wind the clock, use the cranked winding key, stored inside the trunk, and wind in a clockwise direction. It's important that you fully wind both the time and the chime at the same time. Remember that "left is for time and right is for chime." Have the pendulum door open so you can see the weights as they travel upwards into the case. As you approach the seat board (the wooden board the clock movement rests on), slow the winding down, stopping 2-6 inches below the seat board. Once you've wound the clock, replace the winding key back inside the trunk and close and lock the pendulum door. It's very important to keep your clock running at all times if possible. If you are going away, please stop the clock before you leave. Don’t let it run down and stop on its own. This can cause damage to the delicate clock escapement. ﻿Daylight Saving Time﻿ — When time goes forward one hour in the spring, just move the minute hand forward, remembering to let the clock strike as necessary. When the time goes back one hour in the fall, stop the clock for one hour and then start it again by swinging the pendulum. Cleaning — It's best to dust the exterior of the clock case regularly and apply Beeswax polish as needed. The clock dial shouldn't be cleaned or dusted. If a cleaning cloth catches the tip of one of the hands, it will bend the hand when pulled away. Once a hand has been bent it is seriously weakened and may break when bent back into place. We recommend that you gently wash the case once a year with a weak solution of vinegar water to lift the surface wax and dirt which has accumulated. Once the case is completely dry, rewax and polish the case. The inside can also be treated and left unpolished. The advantage of this is that if the wood starts to dry out, then the wax will be drawn into it and reduce, to some extent, the risk of further damage to the case. Moving Your Clock — NEVER move your clock without dismantling it first. You can easily damage it by just picking it up and moving it in one piece, even if it's only a few feet. Start by carefully removing the hood. The pendulum should be removed next, followed by the weights. Wind the clock so the weights are as close to the seat board as you can get them, leaving yourself room to put them back when reassembling, and simply unhook them from the cords. You can now lift the dial and movement from the case and away from the trunk. Your clock is now ready to be moved safely to its new location. If you will be transporting the clock, be sure to carefully pack the components, making sure the weights can't slide around. The art of clock making during the reign of Maison de Bourbon proved to be a very recognized skill. Elegant timepieces made hundreds of years ago were highly intricate and much more precise than today's clocks. Designed and made to last for several centuries with proper care, clocks were originally made for royalty and the upper class who could afford them. They were a symbol of wealth and power and owners proudly displayed their clocks in entry ways or parlors so family and guests would be reminded of their status. the majority of clock and watchmakers refused to renounce their faith and emigrated to England. With so many talented craftsmen now living in England, France no longer dominated this luxury trade, so as a means to protect the flourishing industry in Paris, Louis XIV imposed a ban in 1711 on the import of clocks from England to France. There are many types and styles of antique clocks. One of the most popular and collectible is the longcase clock, a tall, floor-standing clock best known for its swinging pendulum and hourly chime. A typical longcase clock stands 6 to 9 feet high with a tall, narrow case and a wide clock face. Some reach heights of 10 feet or more. The reason being that the weight-driven movement contained in the hood or bonnet requires a long case to house the swinging pendulum, often 3 feet tall, that keeps the clock ticking when wound, as well as the weights, which need to drop several feet for the clock to run a full week. Longcase clocks were first made in the mid-17th century and have been referred to as tall case, floor, coffin, hall, standing, upright or long clocks over the centuries. The term grandfather clock wasn't introduced until 1876. According to tradition, an American composer named Henry Clay Work, while a guest at the George Hotel in North Yorkshire, England, became intrigued with the tale of an old longcase clock in the hotel lobby. The songwriter was so fascinated with the story that he wrote a song called "My Grandfather's Clock." The lyrics tell of a clock that was "too tall for the shelf so it stood ninety years on the floor" and that "stopped short – never to go again” when the grandfather died. The song became a huge hit in America, selling over a million copies in sheet music. The term “grandfather clock” immediately became synonymous with the tall, freestanding, weight-driven pendulum clock that inspired the song. Most of our longcase clocks are 8-day Comtoise clocks, the name given to the standard variety of French longcase clocks found all over France. These provincial, weight-driven clocks were originally made in the Franche-Comté region beginning in 1680. Comtoise clocks, also called Morbier or Morez clocks, after villages in the region, were built on iron-strip frames in the manner of Gothic clocks. The earliest dials were pewter or brass with black filled numbers and a single hand. Convex, round enameled dial faces with two hands were used after 1750. Cast brass headpieces adorned the clocks from the late 1600s to the early 1800s. The motif of the various headpieces is an indication of the politics of the time. Clocks with the royal arms and a backward looking coq (rooster), which symbolized vigilance, were popular during the reign of Louis XVI, which was considered the greatest period for French clocks. The rooster and the Phrygian (Liberty) cap motifs were used during the French Revolution. Eagles replaced the rooster during Napoleon's reign. Brass repoussé frontons depicting scenes from everyday rural life, such as wine making, weddings, young lovers, harvests, dancing, hunting and other happy events replaced the cast brass headpieces in the early 1800s and were used until the end of production in 1914. One of the most common scenes incorporated a pair of cornucopias, classical anthemion ornaments, a basket of flowers and a sunburst. From about 1805 until 1850 the surrounds were made of two pieces joined together at about the three o'clock and nine o'clock. The surrounds became one piece in 1850. Another interesting feature of Comtoise clocks is that they strike the hour twice, ringing on the hour and then two minutes later. Some call these prayer repeat clocks — the first chime is a call to prayer, and the second signals time to begin prayer. This religious tradition dates back to the 12th century when most clocks were made for churches and townspeople relied on the clock's chime to know when to eat and when to pray, as well as the time. The plates holding the gears together in these provincial clocks are miniature versions of those seen in the old church tower clocks. The clock also strikes once on the half hour. An era of cottage industry began in 1830 when individual clockmakers stopped manufacturing clockworks and farmers from small villages and hamlets in the Jura Mountains began producing clock parts during the harsh winter months in order to survive financially. Because the winter season could last up to six months, with less than three hours of sunshine a day, the poor mountain farmers were always looking for ways to earn more money. They took advantage of the natural resources around them and chose to make clock parts when iron ore from the nearby mines became available. A local broker would provide rough cast clock parts to families in the villages of Morez and Morbier, with different members of different families responsible for producing specific clock parts. One group turned arbors the entire winter by the light of the fire, while another created wheelworks and hammer arbors. One group would make the dials, and yet another one produced the hands. The finished parts were then delivered to the local workshop on market day each week. If the workshop was satisfied, new materials were provided — meaning another week of work for the hard working mountain people. It was essential to their survival that the workshop employ them during the long and severe winters. The frames, posts and other parts of iron were made by blacksmiths in the workshop itself, because these parts determined the final dimensions of the clock. Once all parts were made, the clock was assembled by the engreneur, the man in charge of the clockwork. The rhabilleur (repairer) then checked all the workmanship and alignments and put the clocks into motion. Once assembled, the clocks were sold to travelers passing through town. Early pendulums were narrow rods that folded in thirds because the vagabond clock sellers needed as compact a load as possible to carry. They often traveled many miles peddling their wares, which included the movements, frontons, enameled dial faces and pendulums. The name on the clock may not always refer to the clockmaker, which can often make dating a clock diffult. During much of the 19th century the dial faces were marked with the name and town of the vendor who sold the clock rather than those of the maker, but all Comtoise movements, if original, are from the Franche-Comté region. After a clock was purchased, the new owner would commission a wooden case to be made by a cabinetmaker who would follow the style of the period and locality. Cases became necessary because even a light breeze could stop a wall clock with a large open pendulum. The earliest cases were most often made from pine with tapering or violin-shaped sides because of the pendulum movement and finished in a faux wood grain or brightly painted in country fashion. Later cases were adorned with ormolu decoration and marquetry inlay. With the advent of better roads and the rail system running through the villages of Morbier and Morez, clock sales skyrocketed. As a result of more streamlined transportation, overly large pendulums and bobs of stamped and painted brass or sheet iron became fashionable. The broader pendulums led to larger windows in the pendulum door so that they could be seen, catching the light as they slowly swung to and fro. By 1850, Comtoise clocks were an integral part of daily life in French households, with clock movements being sold as far north as Calais and as far south as Marseille. Small, independent clock factories began popping up around 1860, leaving the village farmers unemployed because factories replaced the cottage industry. Between 1860 and 1890, over 60,000 clocks were manufactured each year. Unfortunately, clock making came to an end in the region with the onset of World War I in 1914.